Commusoft's new intelligent scheduling feature is designed to help your business automate scheduling and find the most efficient engineer schedule possible. Optimised diary management can save businesses countless hours of admin and engineer travelling time, as well as freeing up space in your diary for more jobs. Inefficient (and sometimes illogical) schedules can be a thing of the past! 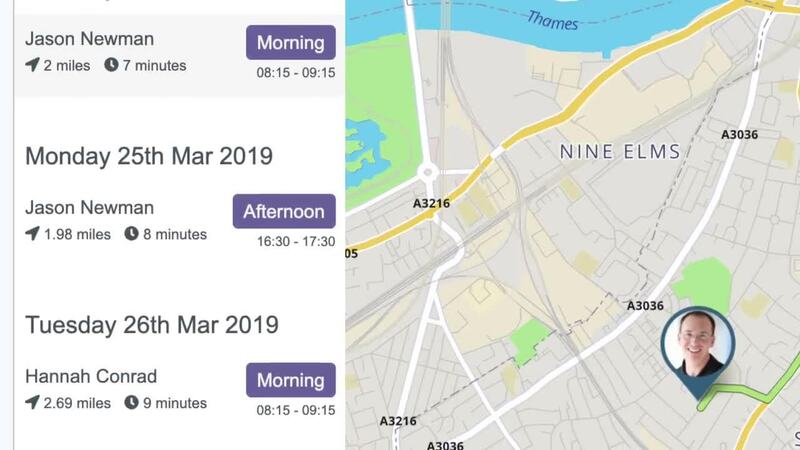 At the core of our job scheduling software is a route optimisation algorithm, underpinned by a cluster-computing framework, however, we prefer to simply call it intelligent scheduling! Automation is the future. You will have surely noticed how automation is increasingly common in everyday life - from things like chat bots on websites, to voice assistants that can automate your daily routines. Field service businesses can benefit greatly from automation - if you use Commusoft, you'll already be automating your service reminders, access communications, invoicing and more - but why stop there? The diary is one of the biggest sources of inefficiency in any field service business, especially for those with many engineers. The reason? Your office staff are human. Don't worry, we know office staff provide a vital role in keeping your business organised and running smoothly. However, no member of your team can effectively organise hundreds of jobs per week and find the most logical route and schedule - it's just not humanly possible! That's where automation and scheduling software come in to assist them. What is intelligent scheduling software? Intelligent scheduling software improves efficiency by automating the complex routing and organisational challenges that are presented when managing multiple schedules. Commusoft's intelligent scheduling system enables your office staff to handle appointments in a smarter way. Instead of simply adding a job into the diary at what seems like a good time, Commusoft can analyse your schedule and identify the most efficient date, time, and engineer for that job. To schedule a job efficiently, the system has to consider all possible options - that's many more data points than a human could realistically process! 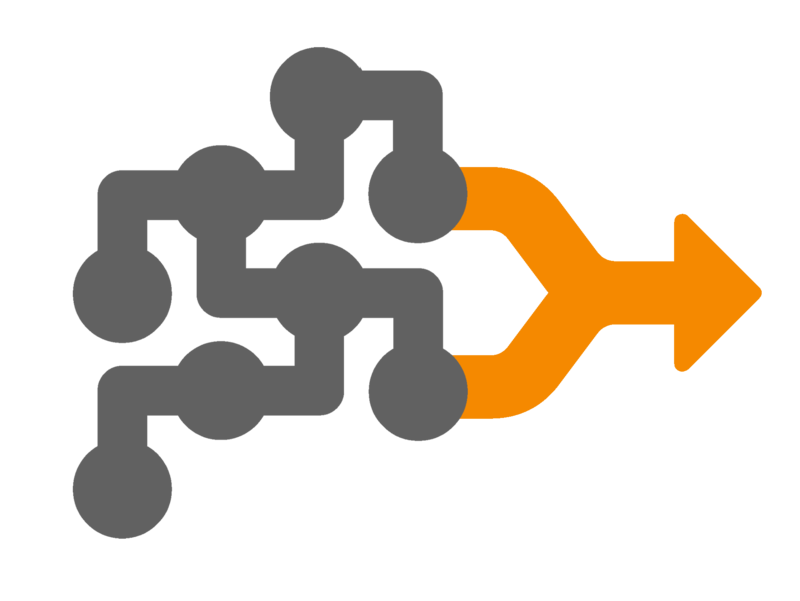 That's why our intelligent scheduling system is based upon a route optimisation algorithm and cluster-computing framework. With all that power, the system can first find the engineers that are able to fit the job in to their schedule, whilst considering both their skills and shift patterns. Next, it reviews each available time slot for those engineers, calculating the total travel time, as well as the impact on existing jobs. Finally, it compares all that information and finds the most efficient time slot and engineer for that appointment. That's how it works when scheduling just a single job. But what happens if you have 10 or even 100 jobs to schedule? This is where the system shows off its computational prowess! When mass scheduling, Commusoft needs to go through all the same tasks mentioned above, however, with 100 jobs the possibilities are significantly higher. Those 100 jobs could be tackled in any order, so to find the most efficient schedule the system needs to look at all route options. That's a total of 10,000 possible combinations! Throw in existing jobs, engineer skills, shift patterns, service windows, and locked events and you can understand just how powerful our job scheduling software is. Whether you intelligently schedule 1 or 100 appointments, the system offers an automated and easy way to make your schedule as efficient as possible. It also frees up time for staff to focus on other areas of the business that may benefit from their attention. To give you a sense of how intelligent scheduling works behind the scenes, we've built a web browser game for you to try out (laptops and desktop only). The game lets us demonstrate the technology that powers this feature in a unique way. By adding jobs to the map you can see the system make decisions and schedule in real time. Simply click on the map to add jobs and watch as the most efficient routes are calculated. Check it out! Note: Whilst the game runs on the same technology, this is not what our scheduling tool looks like or how it functions in practice. Now you know why you need to automate scheduling and how our intelligent scheduling technology works, let's show you what it actually looks like within Commusoft. This week we are focusing on our suggested appointments feature, with more information on bulk scheduling in the coming weeks. Suggested appointments solves two of the the most basic scheduling questions that your staff will have: who should I book the job for? And when should I book the job for? Our powerful system reviews your schedule, analyses driving distances, checks the skills required for the task, and always respects shift patterns set for your engineers. Through this process, you can be confident you are not just sending the right person for the job, but sending them at an efficient time too. By doing the hard work for you, Commusoft gives office staff time back in their day to progress other important tasks. Analysing driving distances reduces travel time and fuel use, and can free up potential time for engineers to take on additional jobs. Finally, ensuring you are sending an engineer with the right skills can improve first-time fix rate and increase customer satisfaction. Once you get started with intelligent scheduling in Commusoft, you'll see a new tab on the diary called Suggested appointment. The suggested appointment interface presents you with a list of suggested dates, times, and engineers for a single appointment. No need to scour the diary looking for space and then trying to work out if it's feasible (let alone efficient) for the engineer to do. We want to ensure that you have some control over the suggestions offered, which is why we allow you to edit several parameters for the system to take into consideration. You can use the calendar on the right as usual to change the date, as well as the user/ user group filters to exclude particular users. In the side panel, you can also change the length of the event, select a date range (+/- a number of days - up to 20 days), and choose to remove any skills associated with the job (should you wish to broaden the search). Below that you'll see the suggested appointment slots. The first suggestion in the list is the most efficient result, getting progressively less efficient as you go down the list. 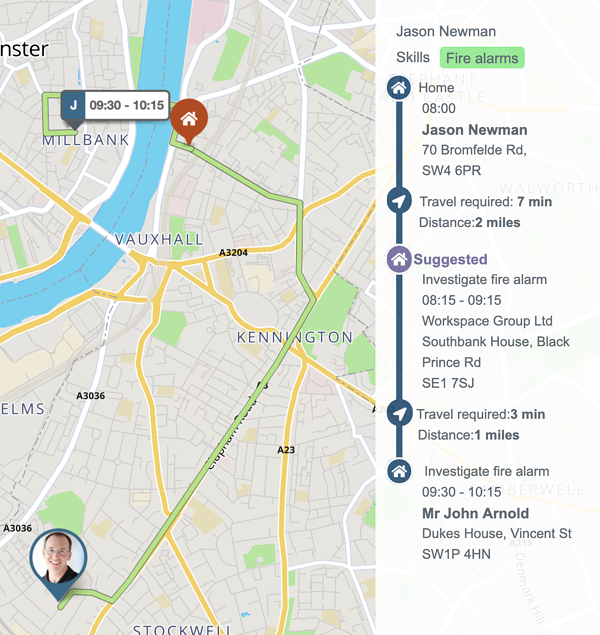 Each suggestion displays the engineer's name, the journey distance, estimated driving time, which service window it falls in, and the exact time to be scheduled. Why do we provide multiple suggestions? Well, you may not always want the top (most efficient) result. Sometimes the user behind the computer has knowledge that the system does not - for example, if the customer has specifically requested an afternoon appointment. By having multiple options, you can combine the efficiency of the software with your team's knowledge of that job, allowing you to find the optimal appointment for every situation. 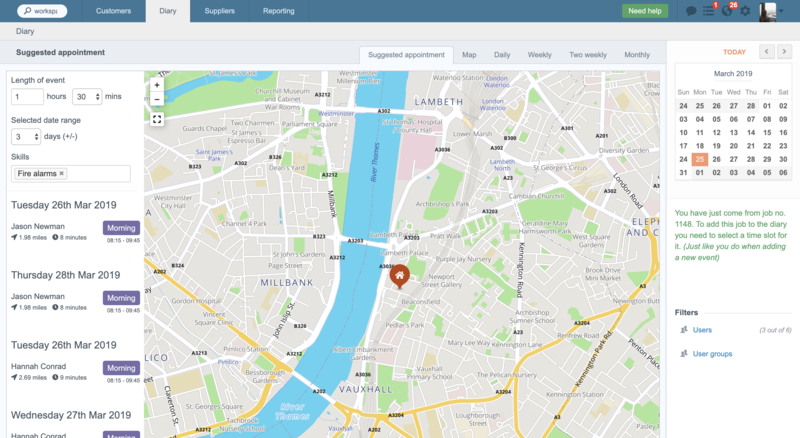 To review how a suggested appointment fits into an engineer's day, simply click to show the route. You'll also see a new side panel appear on the right of the screen with further details. This side panel offers detailed information, including where the engineer would be travelling from before the job and where they will be travelling to afterwards. Remember, the intelligent scheduling system factors both the inbound and outbound journey for the engineer into its calculations! If we take a look at the example above, we can see that Jason Newman will have a 7-minute journey from his home to the suggested appointment. He'll then have just a 3-minute journey to his next job, making for a highly efficient schedule. Simply click the service window button next to the suggestion you wish to pick and you'll proceed to complete the booking. It's that easy. That covers how suggested appointments lets you quickly book single diary events into the most efficient slots in your schedule, plus find the right engineer for the job. Want to discuss implementing intelligent scheduling into your business and the benefits of our Automation plan? Book a demo now or give use a call on 0203 0266 266! We also have an upcoming event where you can learn more in person. As we mentioned earlier, intelligent scheduling can handle more than one job at a time, even hundreds of jobs... more details on that coming soon. Looking to schedule multiple jobs at once? 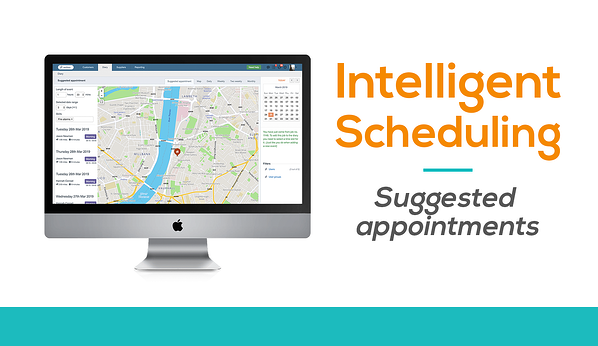 Intelligent scheduling also includes the ability to mass schedule appointments. It's an incredibly complex, but highly effective way of planning your diary - and once again, Commusoft's intelligent scheduling system does all the hard work for you. We'll be sharing more details on our mass scheduling feature in the coming weeks, so keep an eye out for that! Want to meet the Commusoft team and learn about new features like intelligent scheduling and stock control in person? Check out our upcoming Commusoft - Product Round-Up 2019 event!